This incredibly versatile playhouse could be any building your child wanted it to be, from a playhouse to a petrol station or a basket ball court! Yes we did say basket ball. With so many exciting features and unique design to match, this playhouse is an absolute joy for preschool aged children and beyond. This superb, innovative children’s playhouse will give the children and grandchildren simply hours of outdoor fun. Constructed from UV resistant plastic means that it will retain its good looks for years and not fade. It is low maintenance needing only a hose down to keep it clean. A cute little stable door and large windows make it bright and breezy inside and it is a colourful addition to the garden. There are plenty of additional features in and out including a petrol pump, phone and cash machine to mention a few – a great all round playhouse we think you’ll agree. Suitable for age 2 years +. 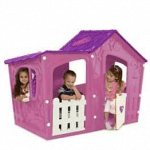 This playhouse provides a multitude of play options and could be anything that your child wanted it to be. The design gives a feeling of it being a town building more than a residential house, with many features and accessories to be enjoyed and creating many options for imaginative play for both boys and girls. 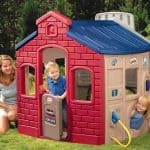 Little Tikes Little Town playhouse: How safe is it? Due to the high quality, lightweight materials used in the construction of playhouses within the Little Tikes range, they are renowned for their safety features and constructed with the small child in mind at all times. With so many features aboard this particular playhouse, does it pose more safety issues than the rest of the range? Let’s find out. Below we discuss any safety concerns that parents might have. Windows: The classic design of Little Tikes playhouses usually feature shutters, however this playhouse has open windows that cause no concern for trapped fingers. The windows are large enough for parents to see all aspects of the interior clearly but not large enough for even the smallest child to attempt to climb through. Door: The stable door design is fantastic for small children, allowing them a full view of who has come to visit them. With the ability to open and close from the top or with the central handle, Little Tikes have done everything they can to prevent fingers from becoming trapped. 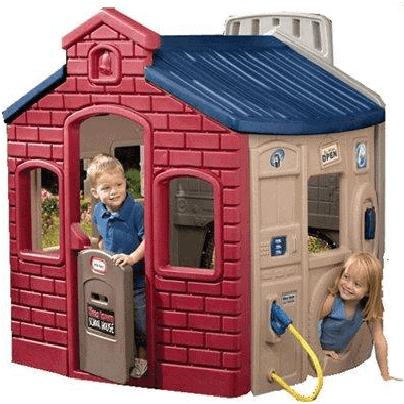 Accessories: This playhouse, due to its town building design, comes with many features for your child to enjoy, including a petrol pump, phone and cash machine, all of which pose no safety issues to your child. The petrol pump is on a cord; however the cord is shortened to prevent any accidents taking place. 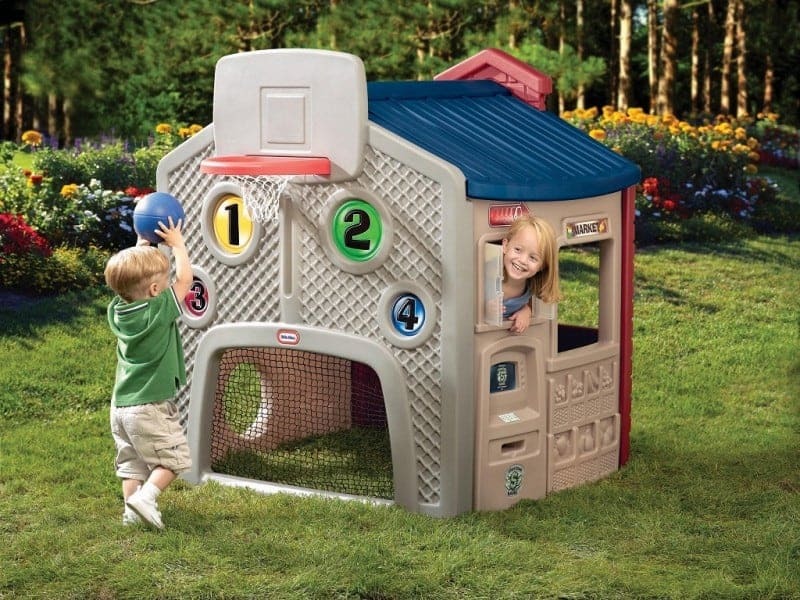 This playhouse also has a basket ball net and a mini football goal…how cooooool is that!!! 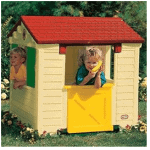 Overall, a wonderfully designed town building playhouse that includes many features yet is very safe for preschool children aged between 2 and 5 years and causes no issues for parental concern. Little Tikes Little Town playhouse: How easy to build? 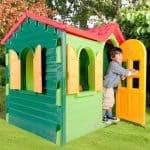 For those of you who look at these wonderful playhouses but simply dread having to put them together for your child, fear not as the Little Tikes playhouse range is notoriously easy to assemble. With no tools required and with the Little Tikes click and build technology, it couldn’t be easier to build your playhouse in under 30 minutes. Of course, if you are nervous about accidentally forgetting to put the roof on or something similar, a very thorough instruction manual with easy-to-read diagrams is available in a range of languages. Little Tikes Little Town playhouse: What is the overall quality like? Little Tikes is an American-based toy manufacturer that is trusted by parents all over the world to provide high quality toys for their children to enjoy. This particular playhouse even has an American town building feel to it, not that this will matter to your child, who will just see it as an amazing playhouse with an incredible range of features for them to enjoy in imaginative play. 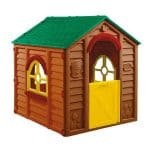 All playhouses within the Little Tikes range are superbly built to last for many years to come. Due to their strong, thick plastic construction and UV resistant coating that will prevent colour fading, any playhouse within this range would make an excellent choice for your child. What makes this unique playhouse stand out from the rest of course is the multitude of functions and features that make it a great choice for preschool children and beyond. From pumping petrol into their Little Tikes car (can be purchased separately) to phoning all of their friends from their new playhouse, this playhouse is definitely value for money. Age range: 18 months to 5 years. 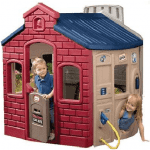 At the higher end of the price range for Little Tikes playhouses, this amazing town building playhouse is feature-rich and could provide many hours of fun for your child. It stands out from the rest of the range because this is the only ‘building’ that isn’t just a house but has so much more to offer both boys and girls. The many features and unique design justify its price. If you are looking for something a little different than the traditional playhouse, then this could be the one for you and your child. The size is small but since I only have one child, It’s fine with me. My son loves playing with this playhouse every day in the summer time. It has a little petrol pump and other nice features for a creative imagination for little ones. This was a great buy. Sometimes he has his cousins over and they all go right to this playhouse. It keeps my son occupied so I can get some things done around the yard. The large windows and the UV resistant plastic are extra advantages with this. It didn’t take even a hour to put this together, it was quite simple. Great for both but so good for boys and that is what I have. Love the petrol pump and the colors. Primary colors always look better to me than the solid boring green yellow or baby blue you normally have in these things. I think there are a lot of little stimulating things for their imagination since it is shaped like a little shop and petrol station. I am an educator and I feel that it is a must to think of their development while they play as well so this one was the best for me. Comes highly recommended and for the price, good value for money. Couldn’t say much wrong with this one. It keeps the nippers entertained and its safe. The misses likes it because it is easy to clean. Little spills come off with ease and they can’t really hurt themselves on it any more than they could anything else really. The price was not extortionate and we can get a couple years out of it. What more can you ask for? We think the age combination along with the space issue should be considered. If you have two very small kids like 2 years and 3 years then ok. But if you have a 2 year old and a 5 year old then you are asking for trouble and that is what happened to us. It says 2+ years but I would stick to 2-3 years with 4 years pushing the limits. If you think you will keep one child away while the other one plays, I got news for you..it aint working. I will agree with the other reviews that state that the ages have to be correct for this. Other than that, the price is right and the safety factor is pucker. It is a great value for money and it cleans superbly. This is just one of those toys that you may have to give away once they grow and they do grow fast. My suggestion would be to have this be for child number one and save it through child two or three. The assembly is nothing and it can fit almost anywhere that is safe for a kid indoors or out. I bought this one solely because of the fact that it has an inventive design. It does not only let the kids have fun, but it also lets them learn using new things such as a telephone or a petrol pump. It is very easy to assemble and it is quite durable, probably because the plastic material is UV resistant. My wife is really happy because now she can take some time off from keeping an eye on them. Although it’s a good deal to get, one problem is that it would get a bit difficult for our two kids to play together in the house as the elder one would be growing up in a year.